Matudnila.com - A Cebu Events Blog: What's new with Jollibee? Try their latest Break & Snack time offering! Home sports What's new with Jollibee? Try their latest Break & Snack time offering! What's new with Jollibee? Try their latest Break & Snack time offering! 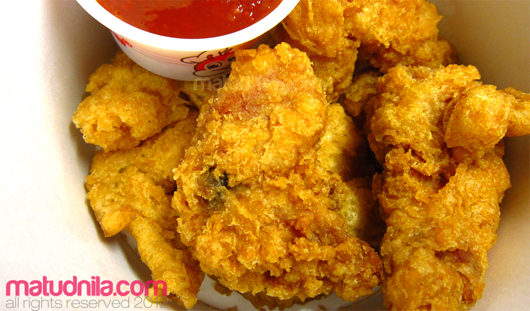 The new Jollibee Crispy Wings is your new chum in your Morning and Afternoon breaks. The newest addition to Jollibee menu is specially marinated for your Snack time with its crispiness that you would want in you snack. You can order the 2-piece Jollibee Crispy Wings with regular Fries or Rice for only 70 pesos and get a regular sized Coca-Cola products by just adding 10 pesos. 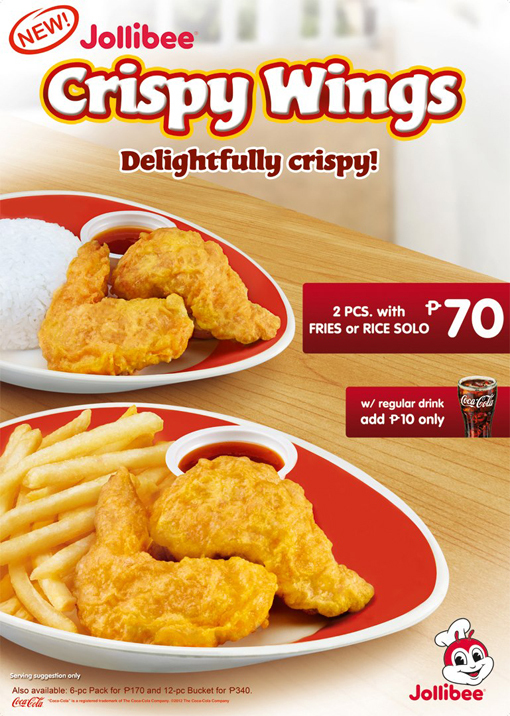 Also available in 6-piece Jollibee Crispy Wings Pack and 12-piece Jollibee Crispy Wings Bucket at 170 and 340 pesos respectively. Fridays become more fun with Jollibee's Crispy Wings Hour Promo. For the entire month of October, 120 Participating Jollibee Stores nationwide is giving away free samples of the its crispiest snack offering, the Jollibee Crispy Wings to all dining customers from 3pm to 4pm. Don't miss the Crispy Wings Hour at Jollibee stores in SM City Cebu, Jollibee Trinoma, SM Megamall L3, Baguio Upper Session Road, SM Sta. Rosa, Jollibee Parkmall Mandaue City, SM City Davao and other selected Branches nationwide. To know the complete list of the participating Jollibee stores nationwide, visit and like Jollibee on Facebook. 0 comments: on "What's new with Jollibee? Try their latest Break & Snack time offering!"